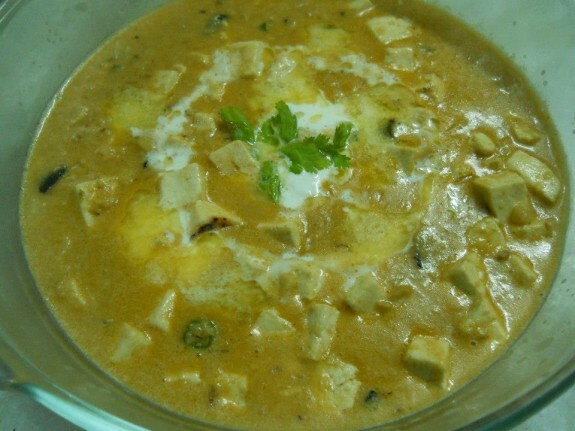 Get yummy smooth buttery silky gravy of Paneer Butter Masala and make your party enjoyable moment. Serve this hot delicious paneer recipe to bring smile on your guests face. 1. Heat oil with butter in a pan. 2. Add the chopped onions. Fry it until light brown in colour. 3. Add ginger garlic paste and sauté it for 2-3 mins. 4. Add red chili powder and mix it well. Now add tomato puree and cook for 3-4 mins more. Add sugar and mix it well. 5. Now add 1 cup warm water on this mixture. Cook it for another 4-5 mins or until the gravy is thick. 6. Add kasuri methi and paneer cubes and mix properly. 7. Add salt as per taste and cook for another 1-2 mins in low flame. 8. Now add fresh cream and stir continuously. 9. Remove it from heat. 10. Garnish it with chopped coriander leaves and fresh cream. Your Paneer Butter Masala is ready to eat.